The venue presents a unique architecture which resembles an enchanted castle built in a peculiar Moorish style. The interiors are characterised by detailed gold ornaments, precious candelabras and valuable marbles. All elements contribute to create an outstanding setting with arches, stairs and vaults: a stunning scenario for photos on the wedding day. Outside the same attention for details is preserved to create an eye catching building. Also a tall minaret completes such a distinctive design. 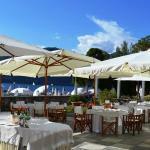 Around the venue, a well tended garden with a permanent marquee hosts wedding receptions for couples who have selected Lake Orta for their romantic wedding in Italy. Civil ceremonies with legal binding can be set in the gardens of Villa Bossi which is set on the shores of Lake Orta and in the heart of the picturesque village of Orta San Giulio. For catholic ceremonies, the Church of Assunta and the Church of Sacro Monte di Orta are at short distance from the venue. Symbolic and Protestant wedding ceremonies can be held at the venue. For the wedding reception, the venue provides a 3.000 sqmt garden with a permanently set marquee. Indoor, the venue provides 3 halls and a veranda which can host up to 120 guests in total. The venue is available from 12 to 18 for lunch receptions and from 18.00 to midnight for evening receptions. The venue can be hired for exclusive use in case of booking of all 14 rooms and suites. Otherwise, some areas of the venue will be dedicated to the wedding reception. This venue is suitable both for intimate receptions and parties up to 120 guests. For the exclusive use of the restaurant area during the weekend, the venue requires minimum 80 guests. Backgroud music is allowed to accompany the reception. Only in case of booking of all rooms for your guests, live music is allowed at the venue (outdoor until midnight, afterwards the party can be moved indoor). This venue provides 14 rooms and suites. No fee is applied for the use of the venue for the wedding reception. Wedding menu price is between €125 and €205 including canapes and appetizers for the cocktail, 3 courses meal, wedding cake. In case of hiring of the venue for exclusive use, a fee will applied and will include the booking of all rooms and suites and the use of the areas for the ceremony and reception. Contact Bellissimo Wedding for a tailored quotation for your reception in this fairy tale wedding venue. The Michelin starred cuisine proposes the freshest ingredients for refined and delicious recipes of the Italian tradition in an original and sophisticated style. The venue provides only 14 rooms and suites which can be reserved for the bride and groom and wedding guests. This assures the utmost privacy of the venue. 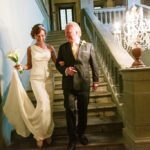 This venue is closed to some of the most beautiful churches of the Italian Lakes district and to Villa Bossi, a lovely villa with garden on the Lake Orta where are set the civil wedding ceremonies. A charming train can be hired for the transport of guests from the ceremony place to the reception venue on the wedding day: an amusing way to enjoy Orta San Giulio! 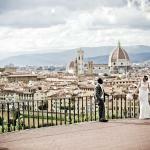 This venue is recommended to couples who are dreaming of a fairy tale wedding in Italy. The setting of the wedding venue and the enchanting scenario of Lake Orta are definitely the perfect ingredients for a uniquely romantic Italian wedding. If you wish to know more about a wedding on Lake Orta, do not hesitate to contact us and we will be pleased to reply to any question you may have.